"FilmFare" redirects here. For the British production company and animation studio, see FilmFair. Cover of the June 2016 issue. Filmfare is an English-language, tabloid-sized magazine about Hindi-language cinema, popularly known as Bollywood. Established in 1952, the magazine is published by Worldwide Media, a subsidiary of The Times Group, India's largest media services conglomerate. Filmfare is one of the most popular entertainment magazine in India. [ citation needed ] Since 1954, it gives popular film awards the annual Filmfare Awards, Filmfare Awards South and Filmfare Awards East. Screen was a weekly film magazine, published in India. Established in 1951, it was owned by The Indian Express publishing group. The magazine was acquired by Star group in 2015 and subsequently closed down. The brand name 'Screen' has been retained by the group as its digital entity. The magazines content focused on India's Hindi film industry, a.k.a. Bollywood, located mainly in Mumbai. It also had an e-magazine version. Kannada is a Dravidian language spoken predominantly by Kannada people in India, mainly in the state of Karnataka, and by significant linguistic minorities in the states of Andhra Pradesh, Tamil Nadu, Telangana, Kerala and abroad. The language has roughly 43.7 million native speakers, who are called Kannadigas. Kannada is also spoken as a second and third language by over 12.9 million non-Kannada speakers living in Karnataka, which adds up to 56.6 million speakers. It is one of the scheduled languages of India and the official and administrative language of the state of Karnataka. Femina is an Indian magazine. It is owned by Worldwide Media, a 50:50 joint venture between BBC Worldwide and The Times Group. Top Gear is an automobile magazine owned by BBC Worldwide and published under contract by Immediate Media Company. It is named after the BBC's Top Gear television show. It was first published in October 1993 and is published monthly at a price of £4.35. As of March 2019 there have been a total of 320 issues published in the UK. Hindi film industry news; reports about the latest quarrels between actors; celebrity gossip and rumours. Previews of upcoming films, and new actors to watch out for. Stars are prominently branded "hot" or "not" depending on their fashion quota. Lifestyles of the actors, their fitness routines. Cover stories, short prose with an array of photos and interviews. Reader's reviews and mails. Box-Office collections. Shatrughan Sinha answers questions asked by readers. 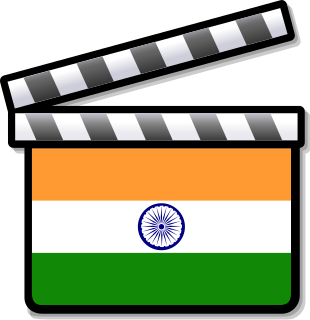 The cinema of India consists of films produced in the nation of India. Cinema is immensely popular in India, with as many as 1,600 films produced in various languages every year. Indian cinema produces more films watched by more people than any other country; in 2011, over 3.5 billion tickets were sold across India, 900,000 more than Hollywood. Indian cinema is sometimes colloquially known as Indywood. Mumbai, Chennai and Hyderabad are the major centres of film production in India. Mother India is a 1957 Indian epic drama film, directed by Mehboob Khan and starring Nargis, Sunil Dutt, Rajendra Kumar, and Raaj Kumar. A remake of Khan's earlier film Aurat (1940), it is the story of a poverty-stricken village woman named Radha (Nargis), who in the absence of her husband, struggles to raise her sons and survive against a cunning money-lender amidst many troubles. Despite her hardships, she sets a goddess-like moral example of an ideal Indian woman. Chitrahaar is television program on DD National featuring song clips from Bollywood films. It was widely watched in the 1980s and 1990s. The word literally means 'a garland of pictures', or more liberally, 'a story of pictures'. It airs for half an hour every Friday on prime-time, where the videos of the latest songs in Hindi film (Bollywood) music are televised. 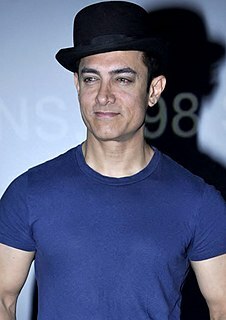 Aamir Khan is an Indian actor, producer, director and television personality. Khan first appeared on screen at the age of eight in a minor role in his uncle Nasir Hussain's film Yaadon Ki Baaraat (1973). In 1983, he acted in and worked as an assistant director on Paranoia, a short film directed by Aditya Bhattacharya, following which he assisted Hussain on two of his directorial ventures—Manzil Manzil (1984) and Zabardast (1985). As an adult, Khan's first acting project was a brief role in the 1984 experimental social drama Holi. A bibliography of notable books on Hindi cinema. Tansen is a 1943 Indian Bollywood film directed by Jayant Desai, featuring K. L. Saigal and Khursheed Bano in the lead roles. The film was based on Tansen, the 16th century musician in the court of Mughal emperor, Akbar. The film featured 13 hit songs, performed by the leads, including "More Balapan Ke Saathi", "Rum Jhum Rum Jhum Chal Tihari", "Kahe Guman Kare Gori", "Bina Pankh Ka Panchhi", "Sapt Suran Teen Gram", "Diya Jalao" and "Baag Laga Doon Sajni". It was the second highest grossing Indian film of 1943. In 2009, it was reported that another film based on the life of Tansen would be directed by Satish Kaushik. The 1st Filmfare Awards were held on 21 March 1954, honoring the best in Hindi cinema in 1953. That year they were known as Clare Awards, after Clare Mendonca, film critic of The Times of India who had died in the same year. Vamsee Juluri is a Professor of Media Studies at the University of San Francisco. ↑ "Jitesh Pillai: Executive Profile & Biography". Businessweek. Retrieved 18 August 2014. ↑ "Idea Filmfare Awards to be held in Mumbai on January 24". The Times of India. 18 December 2013. Retrieved 18 August 2014. ↑ Press in India, Issue 33. Office of the Registrar of Newspapers for India (RNI). 1989. p. 75. ↑ Anandam P. Kavoori; Aswin Punathambekar (1 August 2008). Global Bollywood. NYU Press. p. 243. ISBN 978-0-8147-2944-1 . Retrieved 30 September 2015. ↑ Sumita S. Chakravarty (2011). National Identity in Indian Popular Cinema, 1947-1987. University of Texas Press. p. 69. ISBN 978-0-292-78985-2. 1 2 3 Aswin Punathambekar; Anandam P. Kavoori; Rachel Dwer. Global Bollywood. NYU Press. pp. 243–244. ISBN 978-0-8147-2944-1. ↑ Tapan Kumar Panda (2004). Building Brands in the Indian Market. Excel Books India. p. 138. ISBN 978-81-7446-391-3. ↑ "Filmfare to toast east's revival". The Times of India . Kolkata. TNN. 9 March 2014. Retrieved 9 March 2014. ↑ "Filmfare steps into eastern turf". The Indian Express . Kolkata. Press Trust of India. 9 March 2014. Retrieved 9 March 2014. ↑ "About us". Worldwide Media. Retrieved 18 August 2014. 1 2 Anushree Bhattacharyya (27 April 2011). "Filmfare goes desi; launches Hindi edition". afaqs!. Retrieved 18 August 2014.